What Is The Definition Of Firmament In The Bible? There are many versions of the Bible on the market, but one version has remained popular for several centuries. That version is the King James Version. However, many people choose not to use the King James Version because they do not understand many of the Old English words. One word in particular is the word firmament, which many people have seen in the first chapter of Genesis. To better understand the word firmament as used in the King James Bible, we will seek to find what is the definition of firmament in the Bible? What is the common definition of the word firmament? 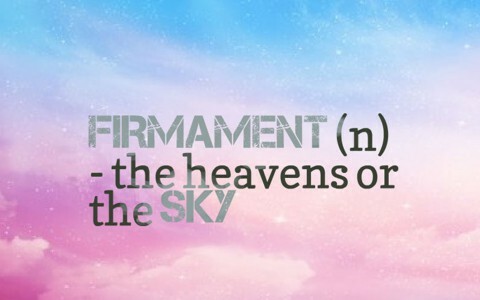 The word firmament is commonly defined as (1): “the heavens or the sky, especially when regarded as a tangible thing.” It originates from the Latin “Firmare” or “Firmamentum,” meaning sky, fix, settle, or to strengthen or support. These original meanings reflected the ancient beliefs by many that the sky was a sort of fixed or solid dome that encased the earth. Some cultures understood it to be a solid dome with the lights of the stars and planets being fixed to it like the lighting in a theater. Others thought that it was a vast black covering that had holes in it that let light shine through. What is the popularity of the word firmament? The use of the word firmament was highest in the early 1600s with the publishing of the King James Bible (3). It was also popular in the early to mid-1800s with the rise of interest in end-times prophecies and the publishing of other lesser used Bible versions. Today, it is used very little, but mostly by people who use the King James Bible. How does the Bible define and use the word firmament? The New Testament uses the word formed, which comes from the Greek words “plasma” and “plasso” respectively in Romans 9:20 in the same way: “Nay but, O man, who art thou that repliest against God? Shall the thing formed say to him that formed it, Why hast thou made me thus?” It is clear that these words refer to something that was forcibly shaped into something (5). The most notable use of firmament is in Genesis 1:6-8, which describes when God commanded that a firmament be created to divide the waters on the earth from a mist like covering that watered the earth (Genesis 2:5-6). This mist persisted until the flood of Noah that was caused by rain and ground water that sprang up. This flood is referred to in Hebrews 11:7 as something that Noah had “not seen.” Likewise, the first rainbow was seen in Genesis 9:13 as a sign that God would never again flood the earth. The word firmament is primarily used in the King James Bible. It is commonly defined as “the heavens or the sky, especially when regarded as a tangible thing.” It comes from a Latin word that communicates the idea of a piece of metal that was hammered thin into a dome that encased the earth. This word also reflected the beliefs that the sky was a covering that was created. A similar word in the New Testament also refers to the idea of something that is formed to be something. The most notable use of the word firmament is found on the second day of creation when God created the sky, or firmament, to divide the ground water from the mist that watered the earth. Resources: Resource – Scripture quotations are from The Holy Bible, King James Version. (1) Google. (2014). “Firmament”. Retrieved from Google, https://www.google.com/?gws_rd=ssl#q=firmament. (2) Webster, Noah (1828) “Wealth”. Webster’s Revised Unabridged Dictionary (1828): American Dictionary of the English Language, Retrieved from http://1828.mshaffer.com/d/word/firmament. (3) Google. (2015). “Firmament”. Retrieved from Google Books, Ngram Viewer, retrieved from: https://books.google.com/ngrams/graph?content=firmament&case_insensitive=on&year_start=1500&year_end=2008&corpus=15&smoothing=7&share=&direct_url=t4%3B%2Cfirmament%3B%2Cc0%3B%2Cs0%3B%3Bfirmament%3B%2Cc0%3B%3BFirmament%3B%2Cc0. (4) Strong, James. Strong’s Exhaustive Concordance of the Bible. Strong’s numbers H7549 and H7554, Peabody, MA: Hendrickson Publishers, 2004. (5) Strong, James. Strong’s Exhaustive Concordance of the Bible. Strong’s numbers G4110 and G4111, Peabody, MA: Hendrickson Publishers, 2004. Previous post: What Did Jesus Mean When He Said “I Am The Lord Of The Sabbath”?